The Minder of the Universe has a problem. Earth is fluxing in and out of existence, and it seems the universe's ultimate gremlin, Milo, is responsible. Meanwhile on Earth, Jason Medley and Theo Barnes are finally meeting up again a few years after a crazy adventure in New Zealand involving a jar of Cosmic Building Material nearly destroyed the universe. 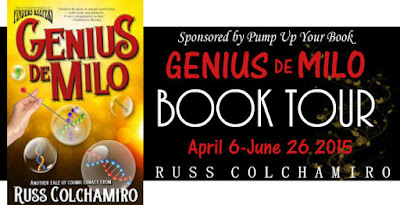 Genius de Milo by Russ Colchamiro is a wild, trippy, bizarre novel that left my brain in a bit of a flux at times! It's the second book in a series, and while it does stand alone, I would have enjoyed it more had I read the first book, Finders Keepers . Once I got used to the style and the characters, I definitely enjoyed the ride. Although different than my typical reading choices, this was a fun change and a good summer read. Another reviewer equated Genius de Milo with the film Bill & Ted's Excellent Adventure, and I think that's a great comparison. Most of the characters spend a lot of time either drunk or high or having a good time in other ways. While the Earth is in danger of disintegrating, and several characters are truly trying to stop that from happening, no one ever seems overly concerned. Laid back is a good word for most of the characters! I liked the different perspectives, from Jason and Theo, to Jamie who comes to Earth from Eternity to find her brother and try to stop the destruction of the planet, to Emma who was banished to Earth after trying to name a planet after herself. It's a lot of silliness and fun, but the storyline holds together from start to finish and some of the characters do grow and experience deeper emotions. 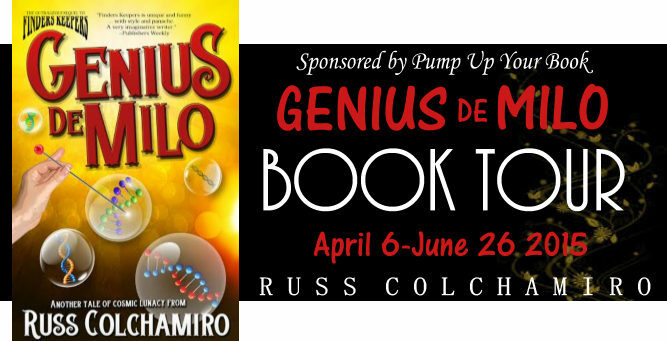 If you're looking for something very quirky and unusual, check out Genius de Milo (or perhaps start with Finders Keepers). It's a fun ride! Connect with Russ Colchamiro on his website, Facebook or Twitter. This review was written based on a copy of Genius de Milo that I received from Pump Up Your Book in exchange for an honest review. This post includes Amazon Affiliate links. If you purchase something using my link, I will receive a very small commission but your price does not change.